Home » Business » LinkedIn evolves groups to enable more interaction and discussions (we hope!). LinkedIn evolves groups to enable more interaction and discussions (we hope!). Groups on LinkedIn have always been a slightly odd place to be for the most part. Everyone seems to join and wait for someone else to talk, to share a nugget of goodness or waits for … something to happen. Hence LinkedIn decided they would attempt to rebuild the group experience and integrate more closely within the main LinkedIn website and app, and these changes have started rolling out to users now. Access to groups directly from the home page feed. It is not quite there yet (as it doesn’t work for groups when you select it) but you can see where they are heading, as per hashtags. It will mean that you can respond and interact on groups within your main homepage feed, no more heading into groups to see what’s going on and wasting your valuable time. Enabling easier conversations with the new ability to reply to comments, name drop easier, edit posts, post multiple images and post native video. 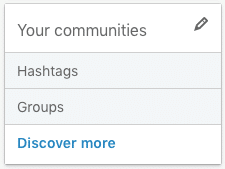 Coming soon, if you’re looking for new groups you may want to join you can discover recommended groups based on your network connections and interests from the ‘My Network’ tab on desktop but it is not released yet…but watch that space. But it is not all good news – in group replies are dead! One of the changes not announced by LinkedIn was the removal of the ability to reply to conversations and threads within LinkedIn groups. Until last month you had been able to reply to anyone, connected or not, that had interacted within a group discussion, but they have removed this as it was being abused by certain audiences. You still have the ability to message someone within the group, to message someone your connected to or even use InMail – it’s just the replies have been removed. This is just the start it seems as LinkedIn has said that they have many more updates coming, but this is a constant theme within LinkedIn as functionality evolves for better and worse pretty constantly! What’s your view on groups within LinkedIn?